Wondering What the Catch Is? Free Coach Training: What's It Worth? Why is it free? We think everyone should have access to quality coach training. How can you do this? We already have the programs. The internet makes it possible to share them for free. Is this legitimate coach training? Yes. We've been leaders in coach training for years. Is this live or recorded training? It's recorded, only. Do I have to sign up to try it? No. The 1st class of each course will be available for anyone to try. Sign up to get the entire course. Will I get SPAMMED if I sign up? No. We hate SPAM too. You can choose if you want to keep hearing from us. Do I have to take all the courses? No. Take the ones you like. Is there a charge for the Coaching Certificate? The Coaching Certificate exam is only available to Members of CLP and UCTP, which are paid programs. Can I download the recordings? Sorry. Downloadable recordings of our paid courses are available, but Free Coach Training recordings are listen-only. How do I practice my coaching skills? We have free Study Groups and Coaching Practicums for pay. 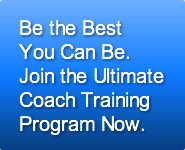 Are any of your coach training programs for pay? Yes, our Ultimate Coach Training Program is for coaches who want to become masters and we have several other customizable programs, as well. Trouble receiving email from us?